Join us at The Spring Fishing and Boat Show starts on Feb 18 and goes through to the 21st. at the Toronto International Center. Hope to see you there. We still have great priceing on Tohatsu and Nissan Outboard Motors. Now is the time to take advantage of fantastic savings. Camp and commercial clients can take advantage of leasing or lease to own programs. Spring is just arround the corner. We are a sponsor of the Rice Lake Spring Fishing Festival May 14 to June 19 2011 on Fabolus Rice Lake. There are over $69,000.00 IN PRISES. All you have to do is catch a taged fish to win one of these fantastic prises. 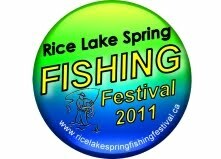 Go to www.ricelakespringfishingfestival.com for details. McGregor Bay Marina along with Tohatsu Outboards are donating a 9.8 hp motor. Will you be the winner of this quality motor?